Moon colonies have long been a staple of science fiction, but a renewed push for lunar exploration suggests they’re on the brink of becoming science fact. Half a century after the last Apollo astronauts left the moon, President Trump has ordered NASA to plan a return. Other spacefaring nations are planning lunar missions of their own, as are a handful of start-ups. Experts say the moon’s low gravity and proximity to Earth, along with its natural resources, make it a perfect staging post for missions to Mars and other deep-space destinations as well as a new frontier for humans to settle. Eventually, the moon will likely have permanent settlements — perhaps underground cities inside the recently discovered lava tubesthat could protect settlers from space radiation. But plenty of lunar activity is planned for the coming decade. NASA’s 2019 budget includes plans for a space station in lunar orbit. The station’s first components will launch in 2022, and NASA is working with industrial partners to develop habitats and landers. The goal is to allow astronauts to make regular trips to the surface by the end of the decade. India and China are planning to put rovers on the moon later this year, and while the Google Lunar XPRIZE — a competition to spur private lunar exploration — announced in January that it would end without a winner, many former contestants say their missions will go ahead. One former contestant, Japanese start-up ispace (which competed as Team Hakuto), recently raised $90 million to build robotic landers and rovers for the moon. These would be the key elements of a lunar transportation network that could open the door to various commercial operations. Foing says one of the best places to build a base might be be at the Lunar South Pole. High elevations there get almost year-round sunlight, which means it should be relatively easy to generate plentiful solar power. And the pole's permanently shadowed craters are believed to hold large deposits of ice, which could be melted for drinking water and split using electrolysis to provide oxygen for astronauts to breathe and hydrogen to use as rocket fuel. The water could also be used to irrigate crops in lunar greenhouses. A 2014 study by Dutch scientists showed that carrots and tomatoes can grow in soil similar to the dusty, rocky soil (regolith) that covers the moon. Lunar soil may also prove useful as a building material. ESA has successfully used simulated lunar soil to 3D print a 1.5-ton building block. “The huge advantage of 3D printing is you don't have to take all the parts from Earth,” says Mark Hopkins, CEO of the Washington, D.C.-based National Space Society. Hopkins says robots remotely operated from Earth or lunar orbit will build basic habitats and other infrastructure before humans arrive, adding that the habitats would likely be buried under several feet of soil to shield inhabitants from cosmic rays and solar flares. Foing expects that by 2030 there will be up to 10 astronauts on the moon, each spending six months before returning to Earth. What exactly will they be doing? In addition to exploring the environment and building a base, he says, they’ll likely be conducting experiments to gauge the effect of reduced gravity (the moon has one-sixth the gravitational attraction as Earth) on plants, animals, and humans. Mining is likely to be another major activity. Ice is a valuable commodity in space, and the moon is also thought to have major deposits of iron, titanium, and other metals. Given the reduced gravity, launching a heavy load from the moon takes only one-twentieth as much energy as launching the same load from Earth. Thus mined materials could be used to supply missions to Mars or to refuel satellites to extend their operational lifespans. As Hopkins puts it, “The moon will be a good gas station." Moon life will be tough. There would be strict limits on time outdoors to limit radiation exposure, Hopkins says, adding that lunar dust is so sharp and sticky that it rapidly degrades equipment and could be dangerous if inhaled. Isolation would be another challenge. Spaceflight is inherently dangerous, and if a medical emergency or some other crisis arose on the moon, help from Earth would take three days to arrive. On the other hand, moon dwellers would be able to communicate with people back home with only a minor delay and have internet access as well. “You’ll still be able to check Facebook,” Hopkins says. 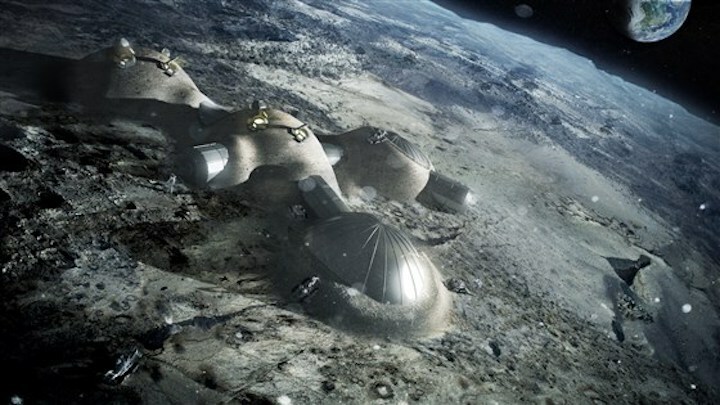 Lunar bases presumably would be governed by the 1967 Space Treaty, which prevents nations from claiming sovereignty over lunar territory or using it for military purposes. And the treaty says any space mission, whether public or private, is the responsibility of the nation launching it. Foing says that makes sense for the foreseeable future, as it promotes international cooperation and helps ensure that lunar development won’t be left to profit-driven companies.